This post has 61 views. I’ve accepted a new job in the Seattle area, and this means moving from the Triangle region of North Carolina all the way across America to the Pacific Northwest. I could have just flew and had everything shipped, but taking a road trip across the USA has always been in my bucket list, and this was the perfect opportunity. I ended up taking a 12 day road trip with family across the continent and saw a lot of interesting and beautiful places along the way. 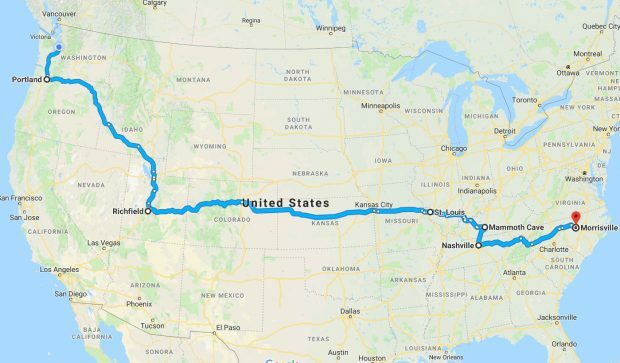 Our trip route took me from Morrisville, North Carolina to Seattle, Washington through 12 states and around 3400 miles. I had to do all of the driving and therefore chose one of the shorter routes. It was still plenty of miles through the plains to the mountains, and thanks to the unpredictable November weather, we had to drive through rain, snow and high winds (not all at the same time). It was a tough drive at times, but we made it to our destination in one piece. Keep reading for the highlights of my road trip across the USA.